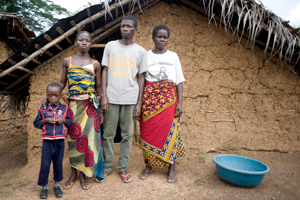 A family waiting to return to their village. The return of refugees and displaced persons to their villages is a priority for Caritas Côte d’Ivoire. Almost one year after the election of President Ouattara, and the violence and humanitarian crisis that followed it, Côte d’Ivoire seems to be well on the way towards stabilisation and peace. The new government has shown its desire for peace and reconciliation. However, Caritas Côte d’Ivoire still has a great deal of work to do to ensure the success of this process and restore strong communal bonds in the nation. New elections are coming up soon. On 11 December Ivorian citizens will be called upon to vote again in general elections.